Are your closets cluttered? Do you need more room in your home or office? Looking for a safe and secure place to store your boat or RV? At StorQuest Self Storage, we can help. Our La Quinta, CA, location is ideal for residents of Indio, Coachella, Palm Desert, and neighboring Coachella Valley communities. We offer you the amenities you need for a positive storage experience. It starts with our truck and driver program. We come to you to pick-up your belongings and bring them back to our storage facility in La Quinta. All you have to do is schedule the truck. We'll even provide you with a free moving quote if you request it. Our facility may be accessed seven days a week. We offer complimentary dollies and carts to expedite the moving process. Online bill pay, acceptance of commercial delivers, and free email invoicing are other features we offer. 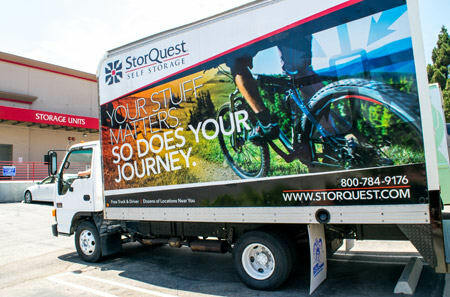 At StorQuest Self Storage in La Quinta, we believe that security is of the utmost importance. That is why we have equipped our facility with the latest state-of-the-art security features. Our property is not only fenced and well-lit, we also monitor our storage lockers 24-hours a day with digital surveillance. As an added measure of protection, every unit is individually alarmed. We do not provide locks; however, they may be purchased in our leasing office. To learn more about the security features offered at the La Quinta location of StorQuest Self Storage, contact us today. We'll be happy to explain the benefits we offer to our tenants.